Fresh and Kiehl's are my to go brands for all things skincare. I have used so many of their products that I should officially be their consumer ambassador. 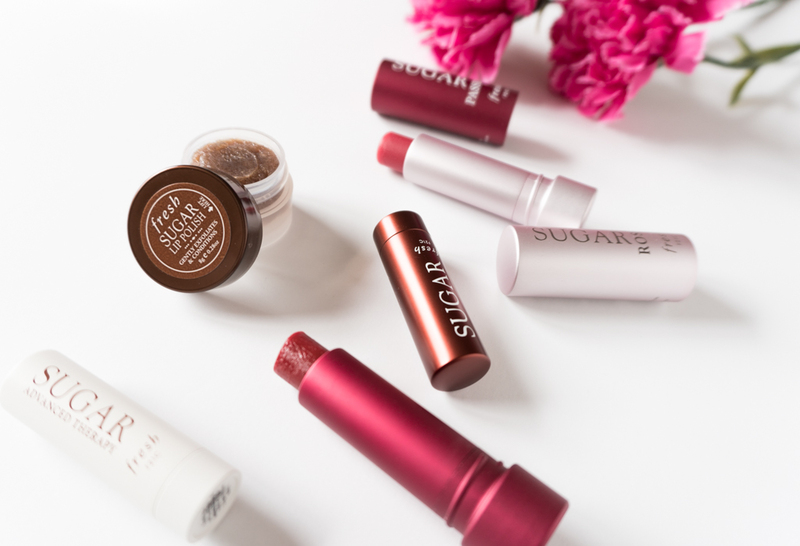 Very recently these beautiful pictures of Fresh Sugar Lip Products started popping up on my Instagram feed and I remembered to click a flat lay of my own stash and in turn review one of my absolute favorite lip treatments. 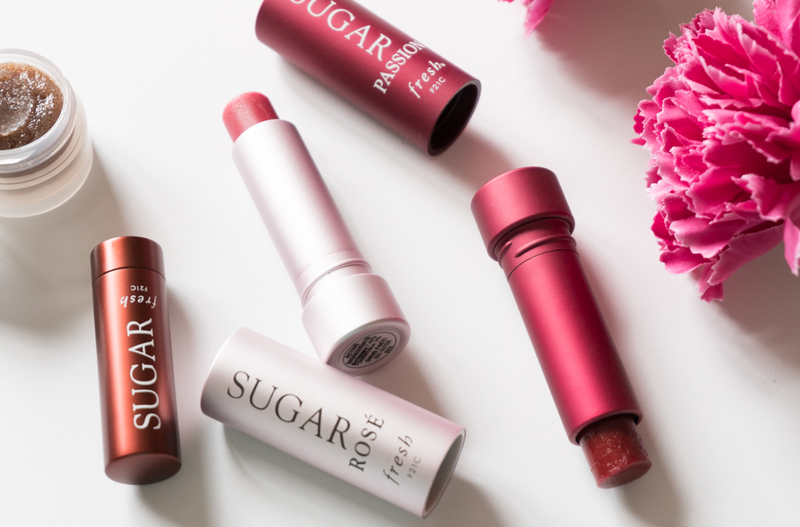 I have had love hate relationship with Fresh Sugar Lip Products. While the original ones with the SPF tend to peel my lips if I use in excess (reapplying multiple times) the Advanced Therapy that comes in White tube works brilliantly. 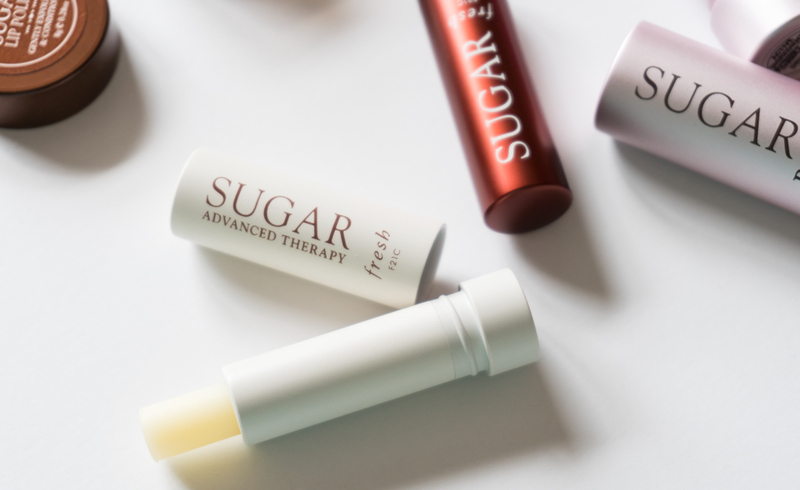 The only reason I end up buying the ones with SPF is because all the tinted version of these Fresh Sugar Lip Treatment come pre-loaded with it. The Fresh Sugar Lip Polish was a product that I thought was not so good initially. I could not get over that waxy/vaseline kind of thing in it, but now that I use it consistently, I know it is one of the best lip scrubs out there. One of my holy grail product. The brand has come with a Sugar Lip Treatment Perfecting Wand and it looks promising, but I picked a Dior Lip Scrub. I have a feeling the Fresh Wand will pop up in a gift set sooner or later. Told ya! I am Fresh fan! 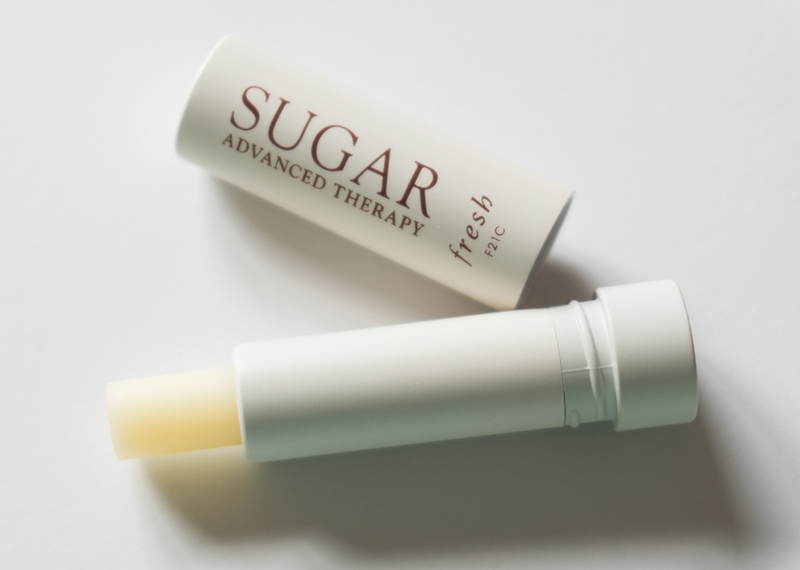 I also used the Fresh Sugar Lip Serum Advanced Therapy. I have reviewed it somewhere on the blog. Not too crazy about that one. Color: I have these in two colors. Passion and Rose and a regular untinted one. The Rose one gives a beautiful rosy tint while the Passion one is very deep and gives a cherry red tint on my lips. Texture and Consistency: These are the softest, creamiest lip product I have ever used in a tube form. It is so creamy and buttery that if the twist the product a little more than needed, it breaks. Especially the mini size ones. Also, these melt if left out in car or beach bags during summers. I remember I messed a tube while I was on trip to Yellowstone last year. But then I cannot blame the lip product, the geysers at park were melting humans! Feel and Effect on Lips: These feel super soft on application. One or two swipes is more than enough to coat the lips. It is not one of those chapsticks where you have to go back and forth multiple times. The lips feel hydrated and moisturized and the delicate tints give the needed freshness. Scent: These do have delicate and pleasing scent. Little lemon'y' not very citrus or anything like that. Not over powering at all. They don't have any flavor though. Packaging: This is the best part. These metal tubes look and feel pretty. They twist up like regular lipsticks and the color on the outside matches the color of the tinted balm inside. A very "Instagram and flatlay friendly' packaging I must say. Verdict: I have the tendency to reapply lip balms. Doing so with this leads to peeling of my lips. If I use it sparingly like 2 times a day, it works great but then I miss that tint on the lips, because no matter what the tints tend to fade after a while. Nonetheless, I always tend to buy one or two of these. The packaging!! Cannot say NO to a beautiful packaging! Now this is a product that is Fantastic! An anti-aging lip treatment proven to repair, nourish, plump, and smooth the look of wrinkles around the delicate lip area. This ultra-hydrating lip treatment corrects and conditions lips for a smooth, youthful-looking finish. It is scientifically proven to repair the lips—significantly boosting moisture, enhancing volume, and improving the definition of the lip area. It is fortified with a high concentration of ultra-nourishing, age-delaying ingredients including hyaluronic spheres to penetrate the skin, fill in wrinkles, and plump the appearance of lips, and sea fennel extract to help smooth fine lines and define the lip area. Color: Creamy, untinted and goes on clear. Texture and Consistency: Buttery soft, smooth, not too thick and not waxy. Application and Effects on Lips: I love to prime my lips with this product. I apply it in the morning and let it sink for like 10 minutes or so, while I do other chores. The product sinks in easily, leaving behind soft, hydrated lips. It fills in fine lip lines and makes lipstick application easy and even. I experienced no peeling with this one. Scent: It has a mild scent, very pleasant and not like typical floral cosmetic perfume. Packaging: White, matte metal tube. Feels good and heavy on hand. The regular twist up mechanism like any lipstick. This too is prone to breaking or melting if not careful. The texture itself is the reason and so it the metal packaging. Verdict: This one worked. No peeling nor dryness. It helped in priming the lips making them soft, supple, plump and hydrated. All good things to say, all good adjectives to add. Usually these lip products come in sets too. Good way to try the brand if you haven't already. A big thumbs up. What are your favorite lip treatment products from Fresh or from any brand in general? The post has affiliate links. All products purchased by me. Not a sponsored post.